Many universities in England and Wales want a sharp increase in tuition fees, a survey by BBC News has revealed. Two thirds of vice-chancellors, speaking anonymously, said they needed to raise fees, suggesting levels of between £4,000 and £20,000 per year. More than half of university heads want students to pay at least £5,000 per year or for there to be no upper limit. England's Higher Education Minister David Lammy said there was an "important debate to be had". 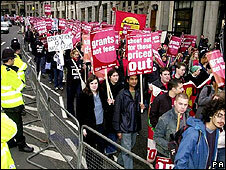 The National Union of Students has warned of debts of £32,000 for students if fees rise to £7,000 per year. The controversy over tuition fees is set to be re-opened, five years after it sparked one of the biggest backbench rebellions faced by the Labour government. University fees must be reviewed this year by the government - and there are already arguments about whether the present £3,500 cap on fees should be lifted. Any changes will affect about a million students on undergraduate courses. Universities UK has set out the consequences of fee levels of £5,000 and £7,000 - arguing that if fees reached £7,000 a market of differently priced courses would emerge. This has angered the National Union of Students, which wants to entirely replace the fee system with repayments linked to later earnings. "In the context of the current recession, it is extremely arrogant for university vice chancellors to be fantasising about charging their students even higher fees and plunging them into over £32,000 of debt," said NUS president Wes Streeting. Students are now planning a lobby of the House of Commons on Wednesday in a protest against increasing fees. Sally Hunt, leader of the UCU lecturers' union, accused vice chancellors of "ignoring the views of the general public as they try to secure more cash by any means possible". Labour backbenchers are also mobilising on the issue - with MP Paul Farrelly, a former fee rebel, putting down a motion in the House of Commons warning against any plans to hike fees. Mr Farrelly said the government would ignore "at its peril" the risks of pushing through another fee increase. The BBC survey, gathering the views of 53 university vice-chancellors, showed a wide range of expectations of the scale of any increase - from £4,000 to £20,000 per year. There were also some expectations of differences between universities and courses - with more than a quarter saying they would not charge the full amount. About one in 10 wanted the cap scrapped altogether so universities could charge whatever they wanted. There was widespread support among vice-chancellors for the principle of fees - three out of four believing they had been a successful policy and nine out of 10 saying they should not be scrapped. Two thirds believed fees had not deterred applications from students from poorer families. The need to review them, part of the deal struck in 2004, will be highly sensitive for Labour - raising questions about its appeal both to its left wing and to middle-class supporters. The Westminster government has so far refused to be drawn into speculation about any changes. "We made a commitment to Parliament during the last fees review that we would return to the issue only after the first cohort of students paying under the current regime had finished their degrees," said Mr Lammy. "We are not breaking that commitment. "There is an important debate to be had now, which is about how we maintain the world class status of our higher education sector." In Wales the means-tested fees are at the same level as England, but for Welsh students at universities in Wales there is a subsidy for the first £1,255. The One Wales agreement between Labour and Plaid Cymru says current fee levels will be maintained until 2009-10. Plaid Cymru has restated its opposition to fees. But under proposals put out for consultation by Education Minister Jane Hutt, the student subsidy would be replaced the following year by means-tested grants. Charles Clarke, who as education secretary took on fees rebels in 2004, says the Westminster government has been proved right about introducing fees. "We won the argument overwhelmingly," he said - arguing that the move had raised the funds needed by university, without deterring poorer students. But Mr Clarke warns that any further increase during a recession is going to be very difficult. "There is no doubt that in the recession there will be a lot of resistance to thinking the fee level should be significantly raised." The education secretary who brought in the first tuition fees, David Blunkett, now says it would be "unacceptable to lift the cap and have a free-for-all across universities". The Conservatives, who dropped their opposition to fees, accuse the government of planning to "push their long-promised review ever further into the long grass". "The student finance review should start now and be as comprehensive as possible," said university spokesman David Willetts. The Liberal Democrats said the question of raising fees would be very different if seen from the students' perspective. The party's university spokesman Stephen Williams called on the government to publish its fee review before the next election. Different types of university will also have their own priorities for funding. The 1994 Group, representing research-intensive universities, have warned that higher education funding must not limited to a "narrow debate on future fee levels". Meanwhile the Million+ group of new universities has emphasised the need for the funding to support students from all backgrounds. Did they change their minds?